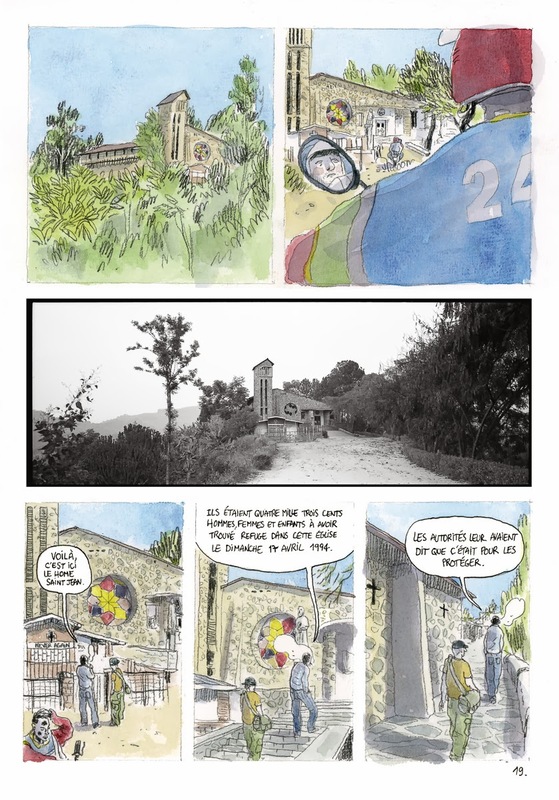 Published in March 2014 on the eve of the 20th anniversary of the 1994 genocide in Rwanda, La Fantaisie des Dieux: Rwanda 1994 (The Gods’ Fantasy: Rwanda 1994) is the result of a collaborative effort between cartoonist Hippolyte and journalist and cofounder of the French magazine XXI Patrick de Saint-Exupéry. An added sticker on the front cover describes the text as “Une BD reportage au cœur du génocide” (A journalistic BD at the heart of the genocide), while the back cover blurb highlights the underlying question at the heart of the text: how to tell the tale of the genocide in the absence of words and in the face of the silence generated by the genocide. La Fantaisie des Dieux: Rwanda 1994 simultaneously serves as a continued effort to implicate those responsible for the genocide (both in Rwanda and in France) and as a kind of commemoration of the genocide through Saint-Exupéry’s account of what he witnessed in 1994 while reporting on the genocide. In fact, the two epigraphs underline the dual goals of the text. On the one hand, the first quote comes from during the summer of 1994 by then-French President François Mitterrand in which he states that a genocide in Rwanda isn’t too important. In light of the extensive research into France’s role—specifically Mitterrand’s unquestionable knowledge of the threat of genocide in Rwanda and his up-to-date awareness of the events of the spring of 1994—by journalists such as Linda Melvern, and Saint-Exupéry himself, the choice of Mitterrand’s quote emphasizes the nefarious character of France’s knowing complicity in the genocide. On the other hand, the second quote comes from Senegalese writer Boubacar Boris Diop’s novel about the genocide, Murambi: The Book of Bones, originally published in 2000 as part of the Fest’Africa project “Rwanda: Ecrire par devoir de mémoire” (Rwanda” Writing as a Duty to Memory). The quote taken from Diop’s novel points to the paradoxical nature of the memory of genocide in that, the more time passes, the less one forgets. In addition to the continuing acts of commemoration and remembering of the genocide through the erection of memorial sites and through cultural production—of which La Fantaisie des Dieux: Rwanda 1994 is a part—the varied and sustained aftermath of the genocide seen in both the political instability of the region (in particular the on-going war in eastern region of the Democratic Republic of the Congo) and in recent court trials of genocide perpetrators who fled to other countries (e.g. Canada, Uganda, and France) reminds us of the still-pressing and urgent need to fight against forgetting and, in fact, work to understand the genocide and what has happened, and is still happening, since 1994. 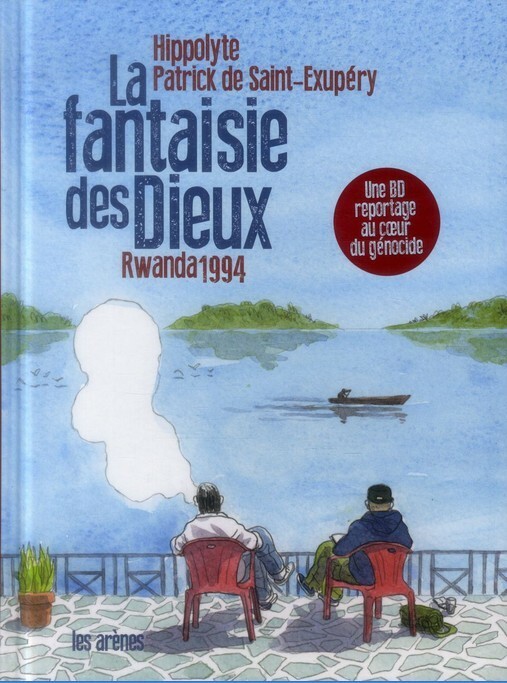 In La Fantaisie des Dieux: Rwanda 1994, rather than present readers with a chronology of the genocide, Saint-Exupéry and Hippolyte chose to focus on one specific aspect of the genocide to avoid overgeneralizing. In this case, they chose to focus on the events in western Rwanda in and around Kibuye (located on Lake Kivu) and Bisesero that Saint-Exupéry experienced firsthand as he accompanied a unit of French soldiers sent to Rwanda as part of Operation Turquoise—an ostensibly humanitarian effort that also surreptitiously functioned as a protected corridor from Rwanda to eastern DRC for genocide perpetrators. Told primarily from Saint-Exupéry’s point of view, the narrative unfolds as an extended flashback. However, the frame narrative of Saint-Exupéry’s return to the region with French cartoonist Hippolyte in 2013 in preparation of the bande dessinée, establishes a mise en abyme of witnessing and recounting. In the extended flashback, Saint-Exupéry meets both genocide perpetrators and survivors who recount their experiences before the arrival of the French soldiers as well as their current situation; while some of the perpetrators that Saint-Exupéry meets are delighted at the sight of the French soldiers and believe that they have come to support what they have been doing, many survivors, especially in Bisesero, explain to Saint-Exupéry that they are still under the constant threat of being found and murdered and they plead with the soldiers and with Saint-Exupéry as well to protect them. During the frame narrative set in 2013 in the same region upon Saint-Exupéry’s return with Hippolyte, Hippolyte bears witness to Saint-Exupéry’s testimony of what he saw, heard, and experienced in 1994. In this regard, the reader is placed alongside Hippolyte as an outsider listening to Saint-Exupéry’s 20 years’ worth of reflection. The representation and comprehension of the genocide thus operate on two levels. On the one hand, the extended flashback depicts the confusion and unpreparedness of Saint-Exupéry and the French soldiers in the face of the reality of the genocide and the growing awareness of France’s involvement. On the other hand, in the context of the frame narrative, the account given by Saint-Exupéry to Hippolyte is undoubtedly informed by almost 20 years of rigorous investigation into the reasons for and interworkings of the genocide on the part of Saint-Exupéry (including the publication in 2009 of Complices de l’inavouable: la France au Rwanda [Accomplices of the unspeakable: France in Rwanda]). In effect, the reader experiences Hippolyte’s psychological undertaking of witnessing Saint-Exupéry’s testimony of what happened to him and what he saw in 1994. The text is, in many ways, Hippolyte’s testimony of his experience of contemporary Rwanda onto which is superimposed Saint-Exupéry’s experiences and, by extension, events from during the genocide. Hippolyte’s aesthetic approach thus attests to his own encounter with Rwanda (including a handful of black and white photographs he took while in Rwanda, as is his tendency with his other journalistic bandes dessinées) and to Saint-Exupéry’s well-informed and complex vision of Rwanda. In fact, this dual mode creates a tension throughout the text that is also reflected in text’s title. The meaning of the title—explained by de Saint-Exupéry as a description of the beauty of Kibuye in western Rwanda—accentuates an important dichotomy about Rwanda to which many other writers and artists have pointed: namely, the extreme juxtaposition of the beauty of the country and the ugliness of the genocide. Indeed, specifically in the visual medium of the 9th Art, this tension is continually reinforced. In La Fantaisie des Dieux: Rwanda 1994, Hippolyte’s careful attention to the aesthetic of the BD is evidenced in the watercolored images and hand-drawn frames. Furthermore, the color palette, dominated by blues—primarily the sky and Lake Kivu—and yellowy-greens—mainly the rolling hills for which Rwanda is known and the army fatigues of the Operation Turquoise unit with which de Saint-Euxpéry traveled—does much to maintain the tension between beauty and ugliness. However, it is important to point out that Hippolyte strays from over-sensationalizing the gruesome violence meted out during the genocide. In fact, even the dead are depicted as part and parcel of the gorgeous countryside, becoming the landscape in their silence. French President François Mitterrand gracing the first page of the text. No, the ugliness in this particular bande dessinée is focalized in the close-ups of those responsible for the genocide—in particular the French officials who knowingly refused to step in until after hundreds of thousands of people had already been murdered—and in the close-ups of those, like Saint-Exupéry himself, who witnessed the destructive force and sheer enormity of the genocide. For example the opening pages present the reader with a cold, gray scene in which Mitterrand calmly sips on a drink served to him in his luxurious Elysée Palace office where he is going over documents that date back to 1990 in which the French ambassador in Kigali warns of a looming genocide. Mitterrand’s distant and closed expression suggest his unwillingness and conscious decision to not act on behalf of the Rwandan people because of his ties to those already in power in Rwanda, in particular President Juvénal Habyarimana and his wife Agathe. Later in the text, instead of presenting the reader with gruesome murders, Hippolyte focuses attention on the faces and expressions of the French soldiers. Through the repetition of shocked expressions and the move from close ups to extreme close ups of the soldiers’ faces and then eyes, he draws our attention to their traumatic witnessing of the effects of the genocide. In large part, the ripple effect of recounting and accounting for genocide in La Fantaisie des Dieux: Rwanda 1994 functions as an antidote to the heavy, deafening silence of genocide, introduced at the beginning of the text, underlined throughout, and restated at the end: “Un génocide… c’est d’abord du silence. Un silence étourdissant” (p. 82-83) (“A genocide … first, it’s silence. A deafening silence”). Thus, the answer to the question posed on the back cover—“Comment raconter?” (How to recount? )—is ultimately, and precisely, to recount. [All translations are my own unless otherwise stated]. For example, Jean-Philippe Stassen’s BD reportage Pawa: Chroniques des monts de la lune (2002) also contrasts the ugly violence of the genocide (i.e. “Pawa,” meaning power, was an important rallying cry of the Hutu Power movement) with the renowned beauty of the region (through the reference to the cartographic term—Mountains of the Moon-used to describe the region in Antiquity that was later taken up by English explorers in the 19th century) in its title.